Irish Fly Craft is based in the Irish Fly Fishing and Game Shooting Museum in Co Laois. Jimmy Tyrrell has been Tying Flies for over 15 years and has his own Fishing Tackle shop on the Museum premises. He gives guided tours to visitors of the Museum and sells Framed flies and prints. 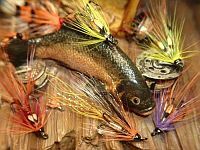 Fly Tying is a great sporting history and tradition that our country has enjoyed over the millenia. Irish fly dressers of old were blessed with great skill and imagination and gave to the world fly patterns that are still tied and used with great success even today.